In honor of the theory that you can never, ever have too many delicious pork tenderloin recipes in your arsenal, I present to you my latest and greatest pork tenderloin find. 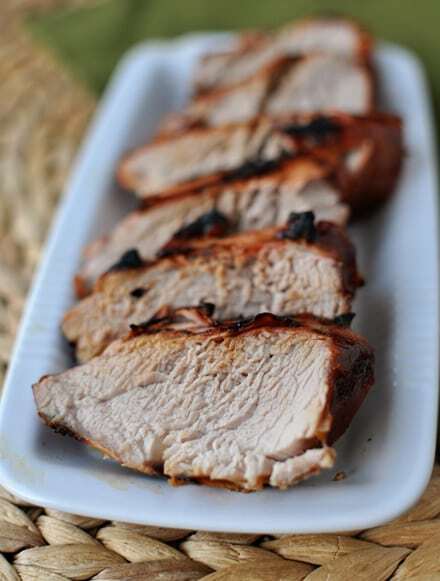 Sent to me by a long-time reader, Beth, this version marinates the pork tenderloins in a flavorful mixture of soy sauce, orange and pineapple juices, a hint of sugar and ginger and a bit of garlic. So simple and so yummy. Rumor has it that this recipe was so coveted among Beth’s family that her brother who created the recipe wouldn’t give it to her for the longest time. Thankfully he relented and shared the love because I need this pork tenderloin in my life and so do you. Grilled to perfection, the tender, juicy pork has all the hints of the marinade – a bit of citrus, a touch of soy, a gentle reminder of ginger and a hint of garlic. I served this with corn on the cob and our fave tri-color pasta salad. While the warm weather holds and grilling season is still acceptable, I suggest you make this immediately. What’s not to love about a lean, tasty, quick meal? In a medium bowl, whisk together the soy sauce, orange juice, pineapple juice, brown sugar, ginger and garlic. Place the pork tenderloins in a ziploc bag and pour the marinade over the pork. Seal the bag and refrigerate the pork for 8-12 hours (perfect to prepare overnight for grilling the next day). Preheat an outdoor grill to medium heat. Grill the pork tenderloins for 8-12 minutes per side, until the pork is cooked through. Tent the pork with foil and let it rest 5-10 minutes before cutting into slices and serving warm. Fresh ginger is very easy to use. Simply peel the skin from the knobby piece of ginger and then grate the ginger on the small holes of a box grater or on a rasp grater. I haven't tried this recipe with ground ginger so if you prefer to use that, you'll have to play around with the amount. Do you need use fresh orange and pineapple juice for this ,or will the kind you drink from a bottle work ? I often use Simply Orange and pineapple juice from the can. If you can, fresh orange juice would be delicious, too. Trying this recipe tonight but substituting wild boar. Serving it with corn bread and salad. Forgot to follow-up. This was delicious using wild-boar. We’re making it again in a couple of days. Can I adapt this for bone-in chops? I haven’t tried it but I think it stands a good chance of working out. This is fantastic! My husband and I made it with a spinach, strawberry and avocado with a cool dressing! Perfect combo! thanks for sharing. This was amazing and so easy!!! Served with your Cilantro lime rice ….. Better than many dishes I have been served at restaurants. Your blog is officially my go-to! Laurie – I just cook it on two sides. It seems to cook through without needing to cook on those smaller two sides, however if you would feel better about doing that, just decrease the time it cooks on every side. Maybe someome else has mentioned this, but I took the marinade, reduced it in a sauce pan and added just a touch or corn starch to make a demi-glaze (aka “dip-dip” in my house). The hubs almost licked the pan. It was delish! This is amazing!! Tasty and tender. My picky 10 year old, while heaping her plate for the third time, said “It’s to die for!” Thank you for a new family favorite! Pork tenderloin and a really lean pork roast are my favorite meats. I can’t wait to try this one. THIS LOOKS TENDER! i wanna try and make this before it gets to cold outside to grill. im sure you have been asked this before, but have you ever thought about makin’ a cookbook? your recipes are amazing! Dee – yes, you could broil this. I would place your broiler rack about 8-9 inches away from the broiler and flip once during cooking. I can’t give you a time recommendation because I really don’t know how hot your broiler will cook but just check it every few minutes so it doesn’t burn. You could also line a pan with foil and roast it in the oven at 425 degrees for 20 minutes or so until it is cooked through. This looks divine, love your new theme! Unfortanely this princess’s dad won’t eat pork, so will just have to enjoy the pictures, will try your fudgey cocoa brownies though it looks like a must try! My pork always comes out dry when I try to make it but this looks nice and tender! 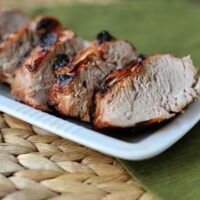 We love grilling pork tenderloin and these flavors sound wonderful! Hooray– I made the blog! I’m so glad you liked this recipe; we have enjoyed so many that you have shared with us. We make this pork a lot in the summer. Because it’s so easy to throw together and tenderloins don’t take up much room on the grill, it’s great for a meal when you’re serving a lot of people. And if you make too much, the leftovers (cold or warm) are never a bad thing. This is the second pineapple marinade recipe I’ve seen in the last week. I’m about to take the hint. For clarification: if one has a meat thermometer, a final temp of no more than 150 degrees F will help guarantee juiciness. I watched a tutorial about using ginger recently and have put into practice what I learned. It makes using ginger extremely easy. Buy a larger piece of ginger, peel and grate it up, then roll it up in plastic wrap like a log about 1/2″ diameter and freeze it in a zipper bag. When you need some you break or cut off the amount you need and put it in the recipe, already shredded up and ready to use! The rest goes back inthe freezer for future use! I love pork tenderloin! I’m with ya, you can never have too many recipes for this great cut of meat!! This one looks fabulous! I never think to grill pork tenderloins when I fire up the grill! I am totally going to have to change that and give this a try! 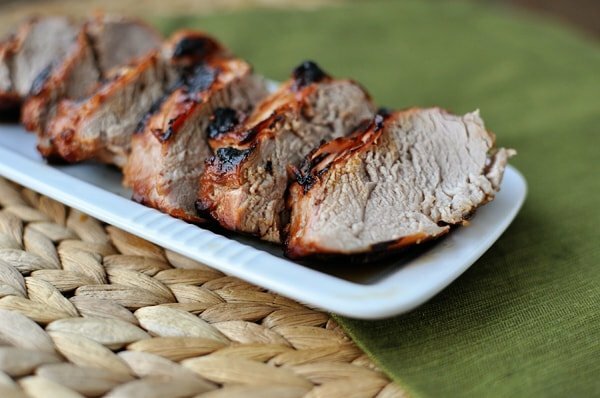 I agree, you can never have too many recipes for pork tenderloin; it’s one of my favorites too. I don’t use ginger a lot, but it’s super cheap to buy a little piece, and you can also freeze it in a ziploc and then peel a new section when you need to use it in the future. Score!